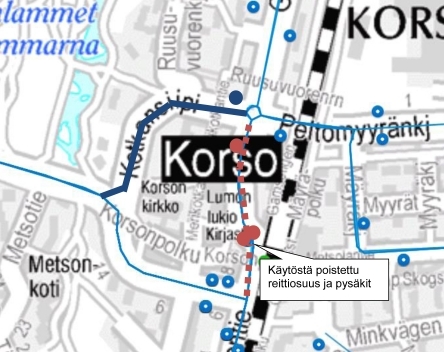 Bus routes will be diverted in the center of Korso on Sunday 11 September from 3am to 8pm due to a fair. Routes 587, 731N, 735, 736, 736A and 739 will be diverted to run along Urpiaisentie, Korsontiel, Kotkansiipi and Peltomyyränkuja. The buses will serve all bus stops along the diversion route.